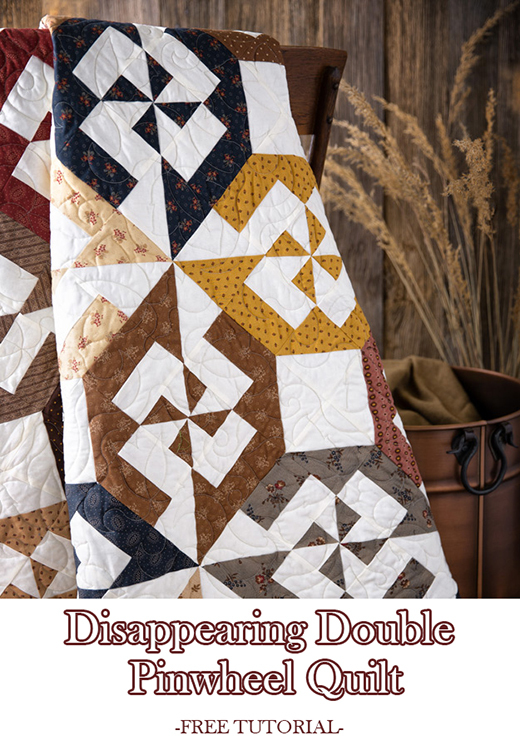 The Disappearing Double Pinwheel Quilt designed by Jenny of Missouri Quilt Co, The Tutorial is available for free. Jenny Doan demonstrates how to make a beautiful Disappearing Double Pinwheel Quilt using 10 inch squares of precut fabric (layer cakes). For this quick and easy project, Jenny chose a "Hickory Road" Layer Cake by Jo Morton for Moda Fabrics. As with all our disappearing blocks, Jenny puts together a simple block, chops it into 9 pieces, rearranges those pieces, and stitches them back together for a totally different look!